For another whimsical summer fireplace screen, this one sports a row of leafy branches with eight rings to hold votive candles. What a fun way to dress up your fireplace in the summer, especially in the evenings - and outdoors as well - when the sun has gone down and the candles are lit. These decorative fireplace screens are made of high quality wrought iron and finished with a bronze powder coat with gold detailing. 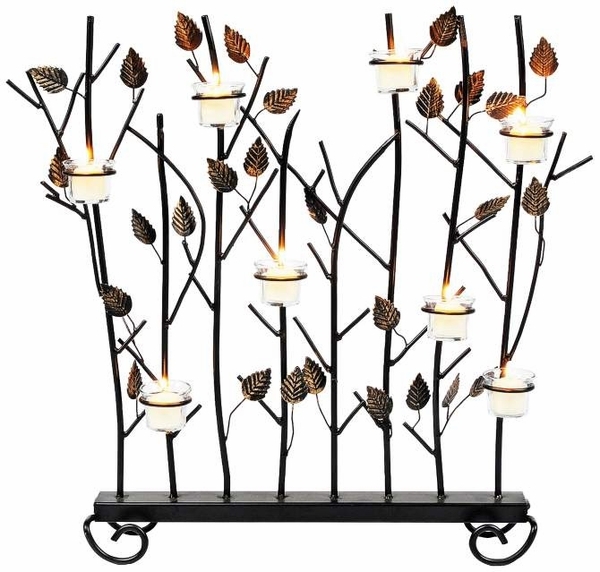 They are a romantic way to dress up your fireplace or anywhere else in your home or garden. Size available is 26 inches wide x 5 inches deep x 26 inches high. What is the size of the votives and where can I buy them? Per the manufacturer, this screen is designed to hold 1 1/2 inch diameter votive candles. The votives and candles can usually be purchased from a craft store or a home decor store.